Last week, Zimbabwean president, Robert Mugabe was the subject of many hilarious memes over his embarrassing fall .In the viral photos, most of his aides appeared to just stand by while he tripped .. 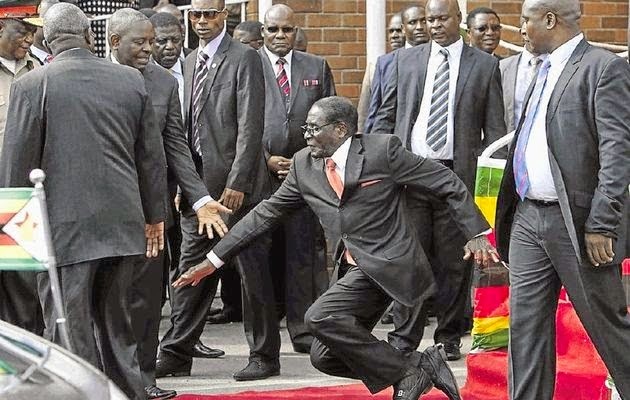 According to TimesLive,Mugabe's security guards received suspension letters over the incident last Friday.Sources said up to 27 members of the presidential security and advance team have been suspended.Officials said an investigation was launched on the night that Mugabe fell. "There are many departments that are being investigated, from Air Zimbabwe, the advance team and the security. I doubt if some of them will come back," said the official close to the developments. "The issue here is simple. The security team was caught napping. Na wa o. Even though say the security people jonze, but to suspend them dey harsh o.